“Retirement Planning Beyond the Dollars and Cents” by Robert Laura CPRC. Now more than ever, advisors must realize that there is much more to retirement than just the dollars and cents. Fact is, people are failing at retirement at an alarming rate because they aren’t prepared for the non-financial aspects of it. “Advance Care Planning: A Critical Component for Building Client Relationships” by Paul Malley, President of Aging with Dignity. Each day, 10,000 people turn 65. As the population ages, there are more life transitions to assist in helping clients navigate complex health and financial issues. An overlooked aspect of an advisor’s role is advance care planning – or defining, communicating and documenting healthcare wishes. Currently, less than 30 percent of adults have an advance directive. “How to Make Your Clients’ Money Last Longer with Withdrawal Sequence Strategies “ by William Meyer, CEO, Retiree, Inc. and Social Security Solutions, Inc. How you “tap” or liquidate retirement savings to generate income impacts portfolio longevity. Similarly, how you coordinate guaranteed income, Medicare and Social Security with the sequence you withdraw client savings impacts how long retirement savings lasts. and prospects as they prepare for retirement. Learn how to beat the “conventional wisdom” used to generate retirement income for your clients. 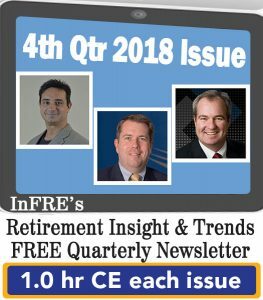 The articles below comprise the 2018 4th Qtr Issue of Retirement Insight and Trends. Click on the links below to read each article online separately, or click here to view and print the issue in its entirety. 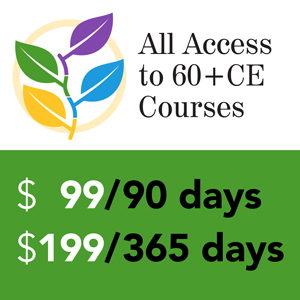 Follow the link at the end to access the quiz, and upon passing with 70% or greater you may receive 1.0 hour of CFP®, CRC®, ASPPA, CLU®, ChFC®, CASL and other CE credit! 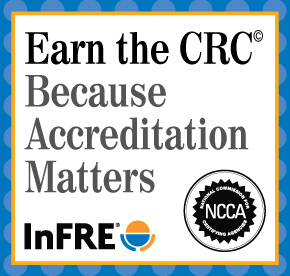 January, 2019 InFRE Update: Welcome to Our New Board of Standards and Standing Committee Members! Many people talk about how retirement is changing, but no one is talking about why or how. My goal is to help you generate a new mindset and a new conversation. In the past, the “haves” are people who had money and lived a life of leisure. That has changed because wealth and leisure aren’t the only key aspects today, especially when you look at retirement. What is important? Health, family, and relationships. More than 30 million people have already used Five Wishes. It’s available in 29 different languages and used by organizations, healthcare providers, and faith communities of diverse faiths from across the country and the world. Because it’s translated into 29 languages, it’s appropriate in very diverse populations and communities. In this article, we’ll look at the value of advance care planning, what it means to plan before a serious illness, and how that fits into your role as a financial advisor. We’ll also help you have a better understanding of how to start conversations with your clients about advance care planning. It’s no joke – this can be a bummer of a topic to discuss. Talking about end-of-life care is hard. By William Meyer, CEO, Retiree, Inc. and Social Security Solutions, Inc.
Social Security planning is very technical. I’m proud that the software we have built based on our research is nation-leading. We were just ranked as the No. 1 Social Security analyzer in America. Our second software, Income Solver, will show you at the press of a button the optimal draw-down and allows you to compare and contrast strategies. As an industry, we focus too much on federal taxes, and what you’ll see for retirees is that we need to coordinate Social Security and Medicare. If you look at how Medicare premiums are calculated, they are based on a tax formula, and it’s the same with Social Security. It’s easy to misunderstand the marginal rate as opposed to a tax bracket. So when you can draw down tax-deferred savings, you are generating retiring income, and you can hurt yourself. 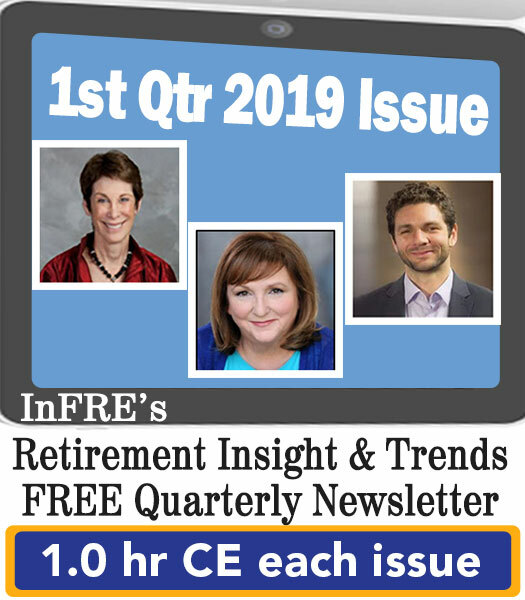 You can earn 1 CRC®, CFP®, ASPPA, and the American College’s Professional Recertification Program (CLU®, ChFC®, CASL) CE credit for the January, 2019 issue of Retirement InSight and Trends. Click here to access the quiz.